Feeling Pain? How’s your Alignment? Frustration was an understatement to what I was feeling when I heard the news. I was in a state of “worry” and obsession about my body and my eating (which was my standard operating procedure in my life at this time). It was compounded by the fact that I had put ON some weight (necessarily) after doing a Bikini Competition the previous June but more worrisome to me was the wedding I was planning for that upcoming October. I wanted to lose some weight and lean up again, but I was afraid of taking things too far in the wrong direction, like I did for the Bikini Competition. It was at this time that I decided it was time to start cranking up my weight training again when I could and try to chill out on my food. But then the pain started. I thought it was just muscle pain cause by too tight of glutes, but then the excessive pain traveled down my leg giving me horrible sciatica. I finally had to go see a Sports Doctor and found out the injury was pretty bad. I had a 10mm bulging disc between my L5 and L6 lower lumbar. I was in serious pain and the doctor’s worried that surgery would be my only viable solution. Needless to say, that idea didn’t really work for me. 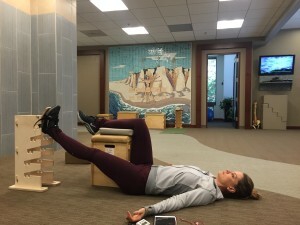 So instead, I started a marathon of treatments to help the disc including a Spinal Decompression machine 3-4x/week, Corticosteroids, Acupuncture AND what would become a game-changer for me– Egoscue Alignment Exercises. Pete Egoscue started this clinic in Del Mar, CA but they now have satellite offices all around the nation. 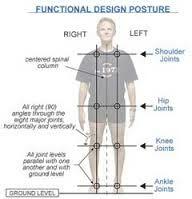 His exercises and principles are all based on aligning out joints to help solve and prevent pain. In perfect alignment your ear should be perfectly over your shoulder, your shoulder perfect over your hip, your hip perfectly over your knee, and your knee perfectly over your ankle. Your hips should be aligned and your shoulders too. 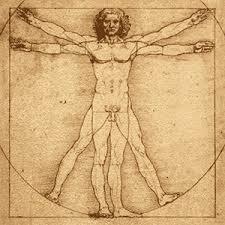 My body looked like a jagged saw when I first took the 4 poses and they drew the lines on me. But as I committed to doing the non-intensive, but oddly difficult exercises to get my small muscles functioning to allow proper joint alignment, sure enough my alignment started to straighten out and my pain started to go away. I was very lucky that after only 3 months of intensive treatment, my bulging disc ceased hurting and I was considered healed well enough to do some weight training again, but I would always have to be careful and couldn’t do a lot of the things I used to do. Here I am at Egoscue Clinic in Del Mar, CA doing the “Tower” treatment which helps release the tightness of the psosas (hip flexor) caused by excessive sitting! Game-changer for your hips and back pain! Well, since I believe in preventative measures to be sure that the bulging disc does not come back, I got into a pretty could ritual of doing my 20-minute menu every morning. About 8 weeks ago, I was able to go in for some pictures and my alignment was drastically improved! I think that news got me a little cocky however, because then as we were traveling a lot I fell out of my morning routine and sure enough, when I went back and got pictures done last week, I was misaligned again! My body could FEEL it too. Isn’t that the truth that just when we think we have everything aligned and are pain free, we cease doing the daily rituals that help us stay that way and sure enough, pain comes back up to bite us again. 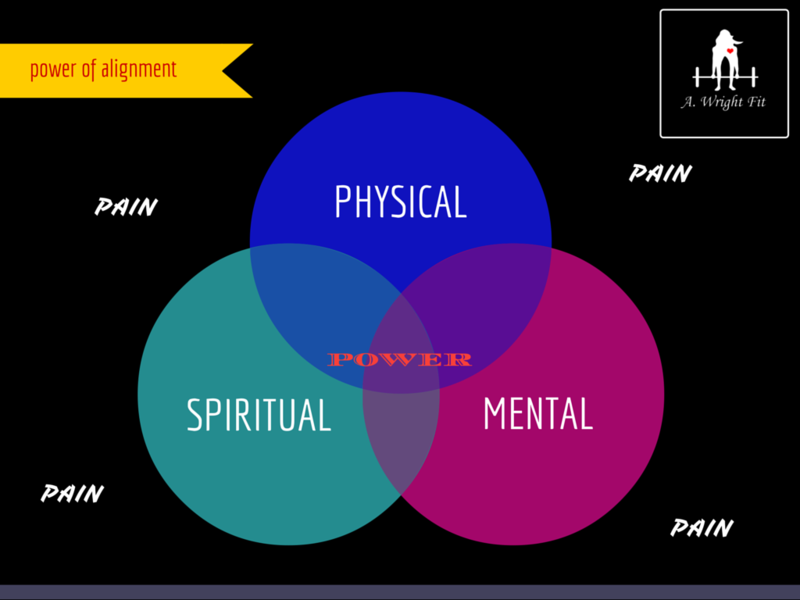 This alignment issue is true for ALL areas of our True Health. 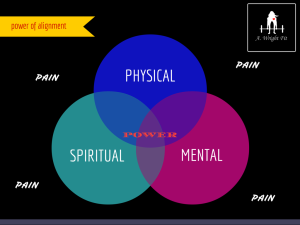 Anytime your health is out of alignment with your True Self (a.k.a Kingdom Version), the person God designed you to be, you will experience pain. MINDSET HEALTH: whenever we get our thoughts out of alignment with the Truth of God, we experience emotional pain and anguish. If our thoughts prey to the devil’s work, we start to believe the lies he tries to tell us like we are not “worthy enough” for God, that God doesn’t care for us, or that we have to do everything on our “own.” It’s painful. SPIRITUAL HEALTH: Along the same vein, once our thoughts misalign with the Truth of God’s love for us, our Spiritual life suffers and we pull back from God or do what I call the “run and numb” method of numbing our feelings with a whole host of “busy” tactics and addictive habits. As we do this, we start to embody the “worldly” values and characteristics as a non-believer. We lose hope and Faith. Just as it was with my body’s alignment, the solution is to do a little bit of work every day to get your mindset and spiritual life back in alignment of which you were designed and called to be. This is why my #1 LOVE these days is the power of HABITS and RITUALS! “You are what you repeatedly do,” so if you want to get out of the pain you are in, you have to simply set up small habits and rituals for all the areas of your health that you commit to. –>Habit: A habit is a new repeated behavior pattern that you insert into your life in exchange for a “bad” habit you want to replace. I believe in having purposeful body habits, mindset habits and spiritual habits for a balance of True Health! –>Ritual: A RITUAL is the little part of *you* that makes that habit more personally rewarding and fun for you to do. Taking the time to set up your new habits in a fun and unique way for you makes you more inclined to truly implement that new habit into your life. Example) Finding that special chair that you sit in, with a fuzzy blanket and favorite mug of coffee to get you to read your Bible every morning is a very useful ritual I enjoy. So, if you want to get your body, mind and spirit back in alignment with the amazing woman/man that God created you to be here’s some ideas for your game plan! List 1-2 new habits for your Body, Mind and Spirit you want to replace some old habits with. Think about how you can #RITUALIZE the above habits in your own unique way. Write down your Specific Action Plan in how your are going to implement each new Alignment Ritual. For example) I will do my 20-minute alignment exercise menu every morning while I am reading my morning devotional book. I will reward myself with a cup of coffee right after and I will commit to doing this 4x/week. Or) I will do buy a Bible Study book and make a goal to do it 3x/week instead of watching the news in the morning. I will sit in the chair facing the window and get a notebook and pen I like while I enjoy my favorite tea. SOME IDEAS TO GET YOU GOING! -Prayer Journal, Lesson Journal (writing the lessons you learn on a given day), Calls with Friends, Therapy/Counseling, Reading Self Help/Educational Books, listening to podcasts etc. As your True Health gets realigned, you will find that at the center of your balanced life is this state of contentment and true POWER. This is your God Space, where you operate as the person you were designed to be. This is a fleeting moment, but the daily practices will help ensure we seek this alignment more and more!